Hey, everyone! It’s been awhile since I've blogged. But I have a really good excuse... I'm preggers! I totally thought I would be cute and have so many things to blog about while pregnant. Um… yeah… Instead I was sooooo exhausted and uninspired! The first trimester was really rough. And my pregnancy brain started nesting and planning for the baby and said, “screw the blog!" Once I reached the second trimester, my energy came back but my motivation did not. Again, way too busy planning for the baby. But even worse, I was way too busy at work. I just completed working 13 days straight, 11 hour shifts typical. We had a really big project that had to go from 20% to 90% design in two weeks. We were contracted for an expedited design, but it still was brutal. Yes, we were paid for it, but did I really want to work all weekend and work 11 hour shifts? Nope. But we did it. And we all got sick with a cold afterwards! No, joke! I really want a gender neutral nursery since we want to have two children. I figure when baby #2 comes along, we will set up the second bedroom as a “big boy” bedroom. Then we can move baby #2 into the nursery. We are owned by a parrot, so we immediately wanted a bird themed nursery. I found a birds on wire mural and knew that we wanted to duplicate this mural as the focus of the nursery. I purchased Birds on Wire Wall Decals from Houzz that is really close to what I originally found (which is shown in the above moodboard). We are going to paint the ceiling a sky blue and switch out our light fixture with a sun shaped lamp. I want curtains with clouds on it and a rug that makes it look like you are bird soaring over the landscape below. Crib: SNIGLAR Crib with Mattress from Ikea ($69.99 + $59.99 + bedding) - we received ours for free from my mom! It's only a few years old and was used for my nephew when he visited (so almost new). Book Shelves: 3 x RIBBA Picture Ledge ($9.99-$14.99 each) from Ikea or repurpose a bookcase from another room. Curtains: FLYGNING Curtains ($14.99/2 pack) from Ikea - although these aren't quite the curtains I am envisioning. I could also repurpose curtains from another room. My low estimate includes a free hand me down crib, the KOPPANG chest, skips the utility cart, repurposes a bookcase, skips the cloud pillow and curtains and assumes 0 cost for the toy chest since we could do a bare minimum to make it usable. My high estimate lets me get all the things. Wow! Guess I love Ikea, huh? My original plan was to find a good used dresser and paint it. I am just worried we will run out of time. We have lots to do and I have never refinished a furniture piece, so having one piece of furniture in need of refinishing seemed like enough. The toy chest is my husbands toy chest from his childhood. His father made it before my husband was born. It is in desperate need of refinishing, reupholstering and new hardware. That is one of my larger projects that I need to do. Thus, Ikea is the perfect place for new, and cheap, furniture. It makes setting up a nursery much more affordable. Plus everything will fit into our car's trunk and I find Ikea furniture so easy to set up. 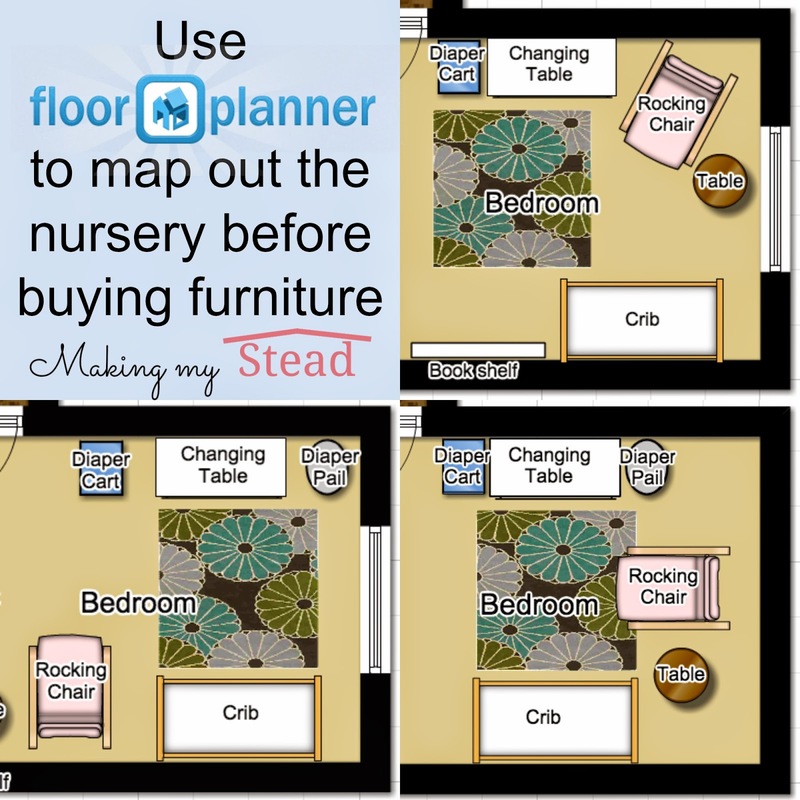 Use FloorPlanner to map out the nursery. 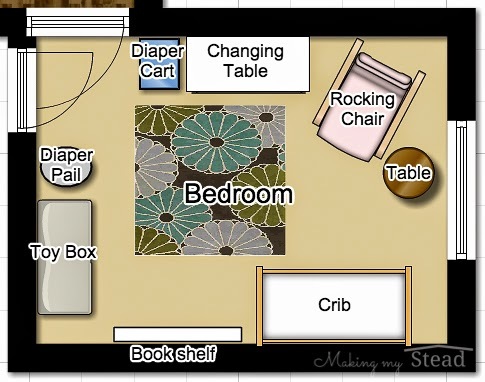 I have been using FloorPlanner to plan various rooms in our house. I like FloorPlanner because I did not have to download an application to my computer and I can save my project. I also like that I can size furniture to the actual dimensions listed for a product. It is really easy to make a mock up of a room that is to scale. They give you one project for free, so I named my project “My House." I have been using this one project file to do each room of my house. I have a small house, so being able to measure everything out and check clearances is really helpful. It really helps for visualizing how a room will layout and confirming that different furniture pieces will fit. 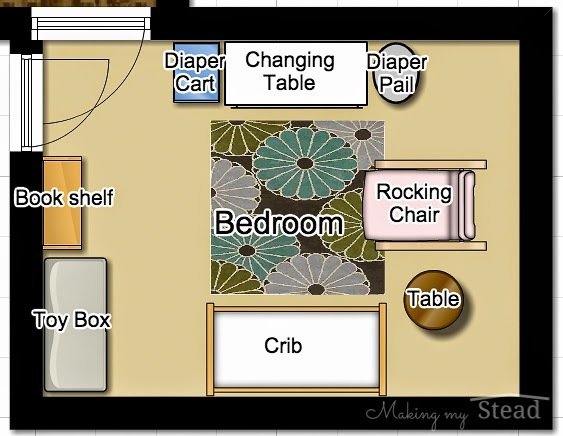 Using FloorPlanner, I discovered that my nursery would not fit a larger dresser than a three drawer dresser. I have seen the HEMNES 8 Drawer Dresser ($229) make beautiful changing tables. 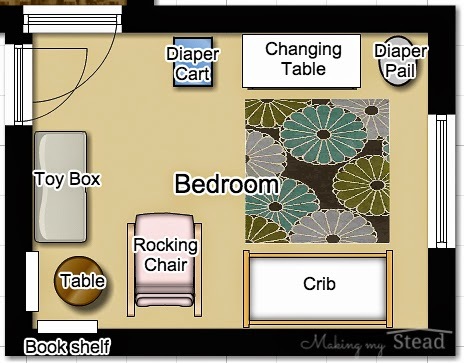 I could probably fit it in with one of the layouts below if I axe the diaper cart and maybe use a hanging diaper bag instead of a diaper pail, but a 3 drawer chest fits the room better and will give a child more play space. Plus, childrens clothes are small and if I can live with a three drawers out of the six in my dresser, then so can a child. Also, I love the idea of being able to move the diaper cart to another room for changing baby. This was my first arrangement. I like having the crib opposite of the door. I am going to do some wall art with my baby’s name above the crib. The rocking chair is opposite and a little pedestal table is in front of the window which has a wall heater underneath it. The window/heater feels like wasted space, as it needs to be free of furniture. What I don't like about this plan is that it doesn't feel like it flows well. The changing table and crib are offset from each other, giving it an unbalanced feel. The diaper pail isn't in line with the changing table, which could be challenging to navigate. I like this option because it consolidates the rocking chair with the book shelves and toy chest. I envision this corner as a reading nook. It also consolidates the changing table, diaper cart and diaper pail in one row, instead of having to cross the room to throw a dirty diaper away. I also like how it utilizes all the spaces along the usable walls. What I don't like about this option is that it forces me to buy the Ribba shelves. I have been thinking about repurposing a bookcase that is currently in my kitchen gathering junk. It has deep bottom shelves which could house baskets with toys in them as well as books in easy reach of a crawler/toddler. Having the Ribba behind the table forces me to get the books instead of allowing a baby/toddler to pick out the book he wants to read. I think this is the option I am going to go with. The crib and changing table are aligned opposite of each other. It feels symmetrical. The rocking chair and pedestal table are in front of the window/heater, which will still allow for the airflow needed for the wall heater. The Ribba shelves are replaced with a my repurposed bookshelf and is accessible for the baby/toddler. I am not sure I like the rocking chair in front of the window/heater. It feels like it might make the room smaller feeling. I also feel like there are a few empty spaces in the eastern corners of the room. This just feels like wasted space to me. For now, I think this third layout is the best option. I might play around in FloorPlanner a bit more or rearrange the actual furniture once they are in the room. 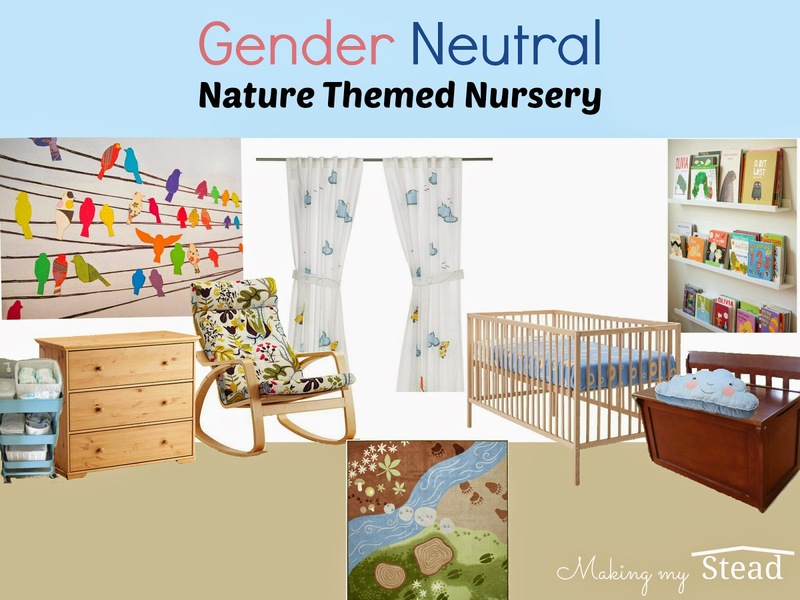 What do you think of my gender neutral nature themed nursery? Any suggestions? Which floor plan do you like best? Or do you have any suggestions on how to make the best use of this space? I'd love to hear your comments below! I love the idea of a gender neutral nursery that still feels age appropriate. As I was reading this post, I was thinking, "Well, of *course* she would use a floor planner to figure out where all the furniture goes beforehand. Hehe. Whereas I, on the other hand, would be sweaty having moved all the furniture around in a thousand different configurations. Lol, love that about you. Yeah, one thing I didn't mention is that a ton of the inspiration online is all designed around the mom's style. So many nurseries are set up with mom in mind that they don't even look like kids rooms. 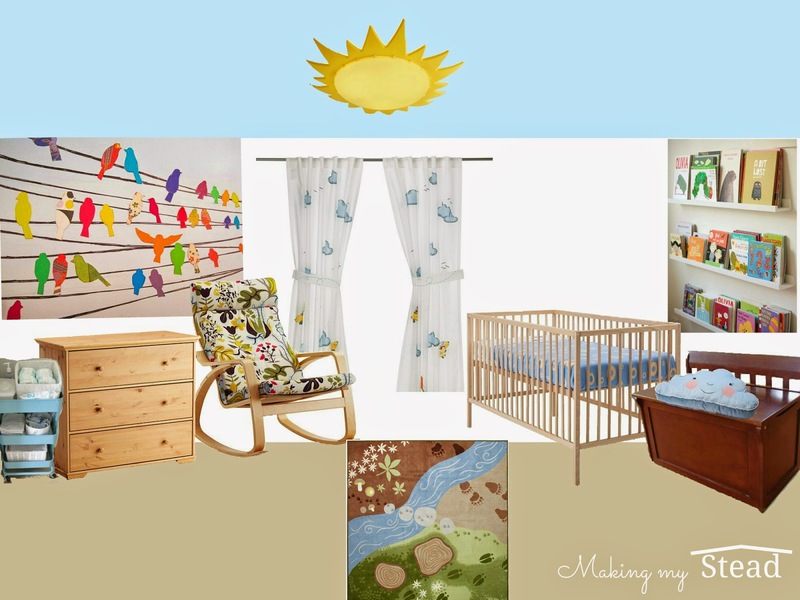 I wanted my nursery to be made for kids so that it will transition easily into a toddler room.